An autumn moor grass with distinctive differences. Very blue upright, stiff foliage forms a large expanding clump. In mid summer through autumn (and beyond) 18″ straight vertical stems support gray/black flowers frosted with light yellow pollen. Excellent appearance year round for an evergreen grass to 1′ tall and 2′ wide in several seasons. Well drained average to enriched soil. Light, consistent summer water in full sun. Excellent massed, plant on 2′ centers. Flowers slowly decay over winter and spent stems may be cut away. Refrain from cutting this plant back to the ground. Winter damage will be covered quickly by new growth in late winter to early spring. Establishes quickly. Cold hardy below 0ºF. Native to Italy/Croatia- its adapted well to a summer dry climate. Nice looking grass. 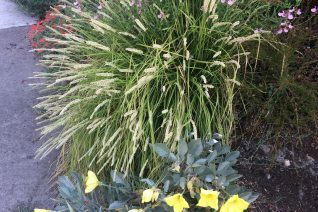 Crazy cool grass that is handsome year round- not entering dormancy in winter and they bloom on compact plants for several months. 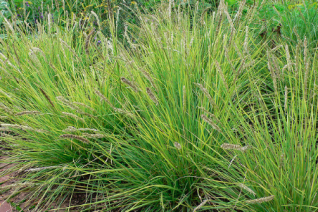 This mediterranean native grass forms lose but not unkempt bunches of arching evergreen foliage. The floral spikes rise another several inches above the foliage for a complicated texture. Full sun, well drained soil, little water once established. To 14″ tall and 20″ wide. 1′ tall in bloom. Very drought tolerant and does not really go through a down time remaining the same aesthetically all year. Accepts regular irrigation with excellent drainage.